There are more refugees fleeing horrible conditions from their countries; other immigrants in the United States are at risk of deportation; still others being denied entry in increasing numbers. How can we help? The Social Action Committee has identified specific ways to make a difference. 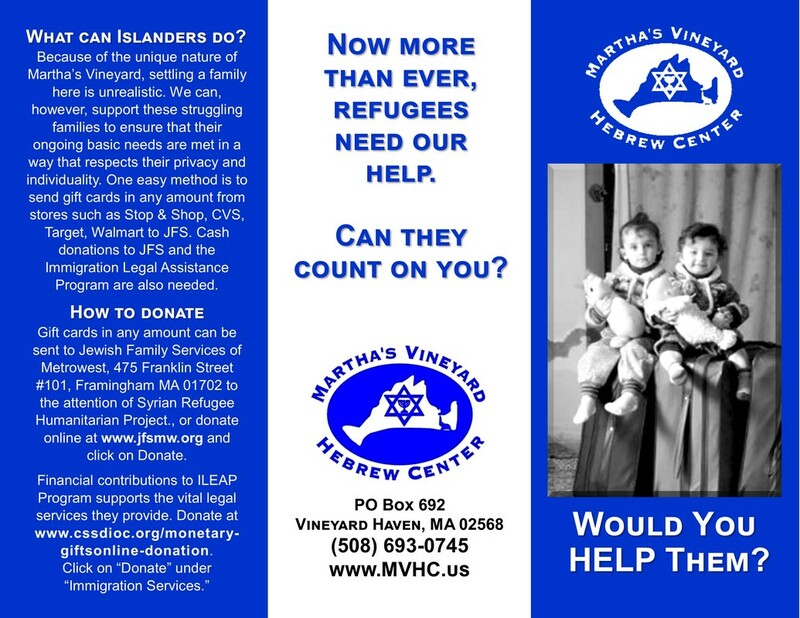 Since there are no Syrian Refugees on the Vineyard, we have selected an agency that provides direct supportive services to Syrian Refugees and other immigrants in Eastern Mass. We have also selected a second agency that provides free legal services to refugees and immigrants in Southeast Mass., including on the Vineyard. For more information on the need, these agencies, and on how to donate, see the brochure below. There are also brochures and donation envelopes at the Hebrew Center. Many thanks to Richard and Alison Cohen for their conscientious work in formulating the program and producing these brochures.